Hibs striker Jamie Maclaren wheels away in delight after putting his side three-up against Rangers only for the Ibrox side to haul themselves level by half-time in a crazy 45 minutes at Easter Road. Hibs surrendered a three-goal lead and found themselves two behind only to claim a dramatic point deep into added-on time as Australian striker Jamie Maclaren netted a hat-trick. A Florian Kamberi penalty and further strikes from Scott Allan and Maclaren had given the home support hope that their side might, just might defy the odds and claim third place in the Premiership table. But Rangers hit back with goals of their own from James Tavernier, Jordan Rossiter and Bruno Alves before the interval, the Ibrox side going ahead soon after the restart through Jason Holt, who was sent off five minutes from time after picking up his second yellow card for a pull on John McGinn. Before then, a Holt shot which had taken a deflection off Josh Windass had put Rangers 5-3 up only for Maclaren to claim his second goal of the game and so put the final outcome back in the mix. And Hibs took full advantage of Holt's dismissal and five minutes of added-on time as substitute Danny Swanson wriggled his way along the bye-line before supplying the pass which Maclaren turned high into the net for to complete a memorable hat-trick. It was all too much for Hibs boss Neil Lennon, who raced onto the pitch in celebration, his antics ending with referee Andrew Dallas sending him to the stand. Hibs had gone into this final match of the season knowing nothing more than an unlikely 6-0 win would lift them from fourth to third in the Premiership reckoning but they got off to the perfect start with the opening goal in the tenth minute. Referee Dallas spotted Rangers defender David Bates knocking over Maclaren as the Australian striker moved into position anticipating a cross from team-mate Vykintas Slivka and immediately pointed to the spot. Kamberi, as he had at Tynecastle in midweek, stepped up with confidence to hammer the ball high into Jak Alnwick's net as the goalkeeper moved the wrong way. Rangers were clearly rattled and a better touch from Maclaren as he met a Paul Hanlon ball which had split the visiting defence could well have brought a second goal, but Alnwick was quickly out of his area to boot clear. A second Hibs goal was, though, merely delayed, Slivka coming in at the back post to nod Lewis Stevenson's cross down for Scott Allan to beat Sean Goss and prod it home. Incredibly, Hibs had a third when Maclaren rose to glance home another Stevenson cross but Rangers hauled themselves back into the match as Tavernier played a one-two with Jason Holt before sweeping the ball beyond Ofir Marciano. The home side were still trying to clear their heads when Rangers claimed a second, Andy Halliday's ball just passing the outstretched boot of Paul Hanlon to give Rossiter the chance to slide the ball home, It had been a crazy half-hour but the scoring didn't finish there, Efe Ambrose's trip on Jamie Murphy presenting substitute Alves with the opportunity to curl in a wonderful free-kick from 25 yards. 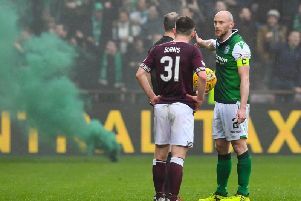 Hibs found themselves behind for the first time in the match nine minutes into the second half, former Hearts midfielder Jason Holt afforded too much space and time asdhis deflected shot beat Marciano again. Rangers stretched their lead with a fifth goal in rather fortuitous circumstances. Marciano appeared to have Holt's long-range shot covered but he was left flat-footed as it came off the hip of substitute Windass and flew into the net. Hibs, though, were not finished, McGinn and Slikva combining to present Maclaren with the opportunity to fire home his second and the game's ninth goal and, with the seconds ticking down, Alnwick looked as if he had ensured Rangers would hold on, getting his fingertips to Dylan McGeouch's shot. But, like Marcano at the other end, Alnwick was beaten for a fifth time as Maclaren got on the end of that Swanson pass to hammer home the equaliser. Hibs: Marciano, Whittaker, Hanlon, Ambrose (McGregor 70), Stevenson (Swanson 85) McGeouch, Slivka, McGinn, S Allan (Barker 65), Kamberi, Maclaren. Substitutes not used: Dabrowski, Gray, Bartley, L Allan. Rangers: Alnwick, Tavernier, Bates, Martin, Halliday, Holt, Rossiter (Hodson 67), Candeias, Goss (Alves 28), Murphy, Cummings (Windass 61). Substitutes not used: Kelly, Herrera, O'Halloran, Docherty.